I don't think I've harped on enough to anyone about how this is my baby sons first Christmas and how everything must be 'perfect' and just how much I love the handmade creations by the lovely and talented Chloris Boris, I'm not joking, I've literally raved to everyone about just how much I am in love with their pieces, I think everyone is sick of it and this stage, especially my fiance but hey, when something is beautiful and exceptionally made isn't it justified to give it high praise whenever you can? This year I am hoping to have a handmade Christmas in any way I can. 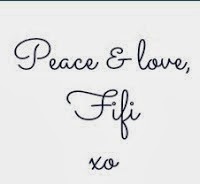 I have gotten some 'make your own decoration' packs from Hobbycraft, I shall be baking galore and some of my baby boy's gifts are handmade keepsakes for him to treasure forever, for me handmade is best and makes the piece and occasion all the more special. 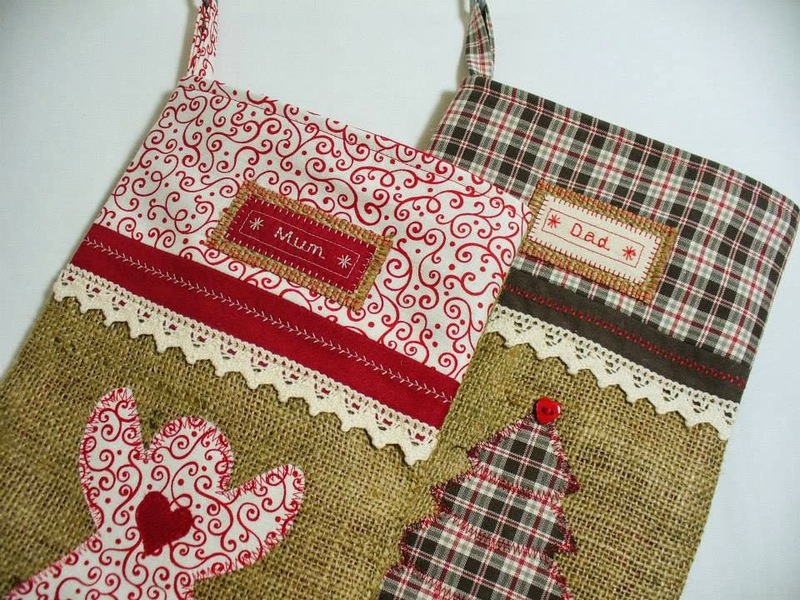 When I discovered that the wonderful Chloris Boris was making handmade Christmas stockings I knew I had to get one for my baby boy. 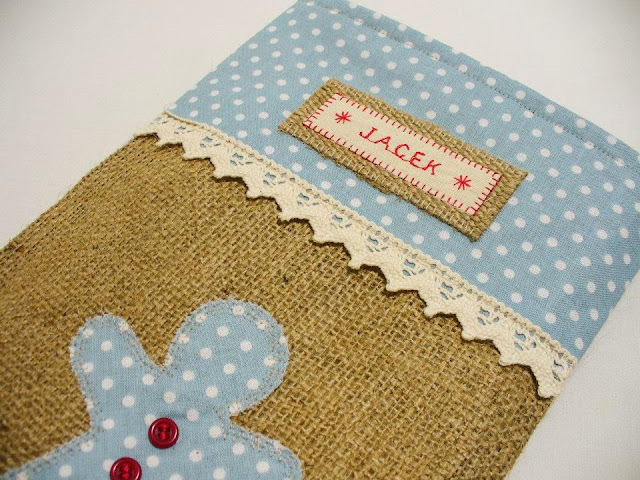 One of the designs really appealed to me and I thought it would be perfect for my boy, a lovely pale blue, edged with a cream trim and decorated with a gingerbread man in the same pale blue fabric as the top and end of the burlap sack stocking. Chloris Boris very kindly sent me the stocking for Tyler Lee and in return I donated to a local neo-natal unit, a cause very close to Vicki, the lady behind Chloris Boris' heart. 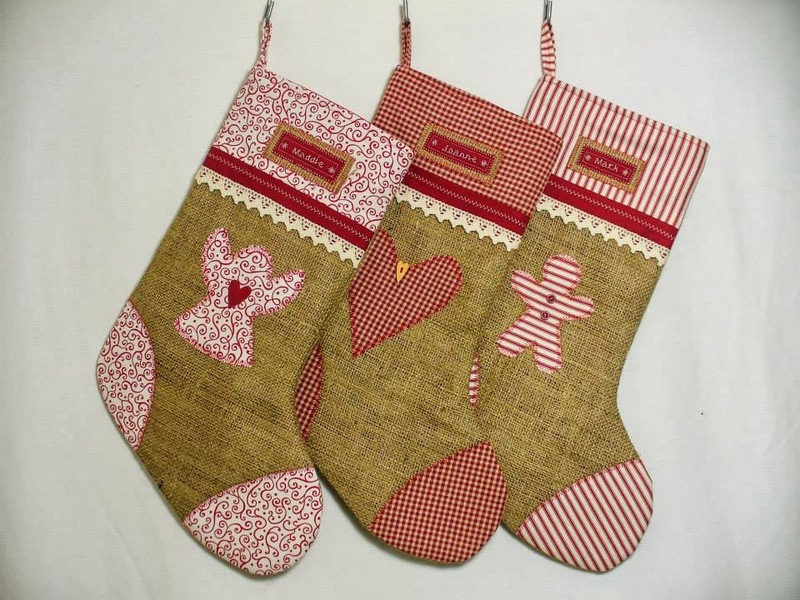 I then decided that I needed to get a stocking for Jacek so I chose the exact same design as Tyler Lee's, it was just so adorable. 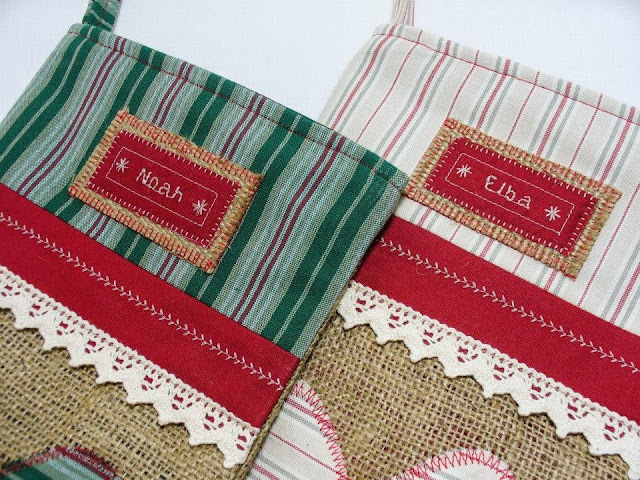 Each of the Christmas stockings comes with whatever name you want embellished into the top, they really are so sweet. I have just ordered my own custom stocking from Chloris Boris which I cannot wait to see, Vicki was kind enough to accommodate me and my fabric colour request so if you have something unique to you in mind don't hesitate to ask Vicki if she can do something custom for you, I'm sure she'll be willing to accommodate you also in any way she can. These stockings are of such great quality and with all of the pieces I have seen from Chloris Boris the stitching and craftsmanship is astonishing, it is so perfect, I am in awe. I'm delighted to have these beautiful stockings to hang on our mantelpiece this Christmas, they are something to treasure and decorations which will take pride of place in our sitting room every Christmas for sure. I can just imagine these filled with sweet treats for us all every Christmas morning. 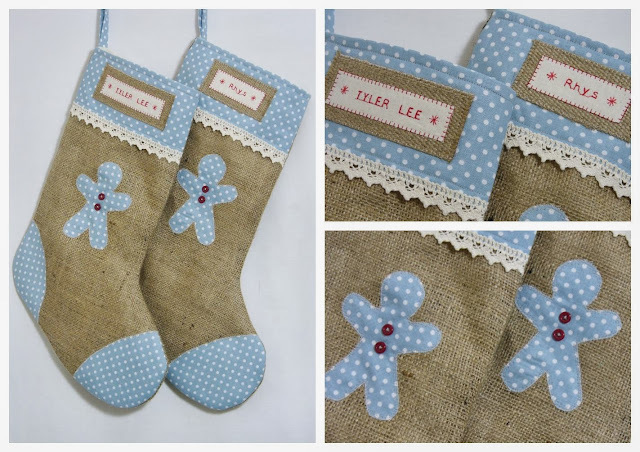 I will always favour handmade and to have these beautiful stockings, personalised with our names hanging in pride of place on our mantelpiece is something very special to have indeed. Chloris Boris Christmas stockings are €14.68 each. 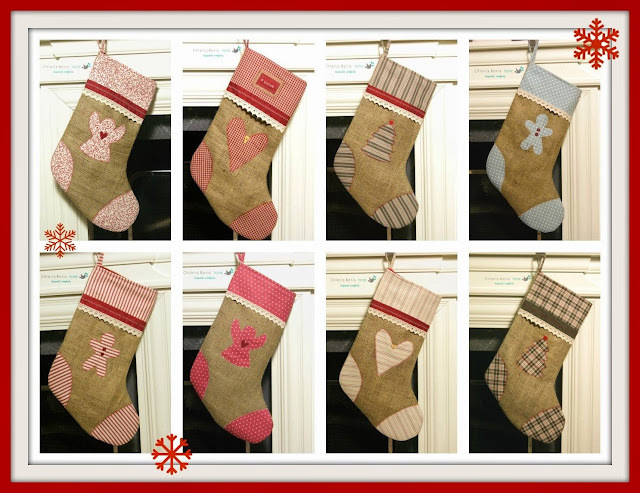 You can browse these beautiful Christmas stockings and other wonderful creations on the Chloris Boris website. You can also follow Chloris Boris on Facebook and Twitter for regular updates and stunning pictures of Vicki's creations.